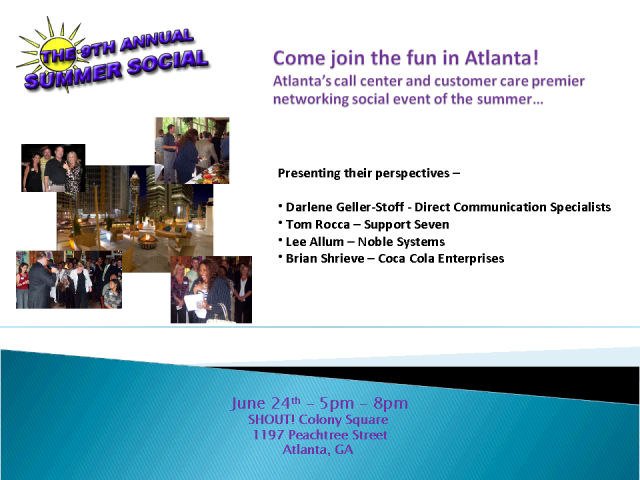 Atlanta's 9th Annual Summer Social Networking Event! Where else can you meet and network with the leading call center, sales, customer service and contact center professionals from some of the best companies in the world, right here in Atlanta? The Summer Social is becoming the premier summer event for busy professionals (like you) to meet fellow industry experts at one of the hottest spots in town - SHOUT! In Midtown Atlanta. The 9th Annual Summer Social brings members and non-members together, enabling a powerful exchange of knowledge, ideas and relationships at an informal and fun environment. You are welcome to invite your contact center and customer service friends, customers, colleagues and teammates to join us! We anticipate more than 250 attendees this year! Please join us for great food, cocktails, a live DJ and lots of fantastic door prizes. •Members of the host associations attend FREE! •Guests and other Industry Professionals attend FREE! . •Your RSVP includes food, free valet parking, door prize ticket and one free drink (a cash bar will be available)! We hope you'll join us for this great networking event and then we hope you'll join the association(s) best suited to you! Title: Atlanta's 9th Annual Summer Social Networking Event!